Samson Studiodock 4i review | What Hi-Fi? The fundamental difference, of course, is size. Place a 4i next to a 3i and it's obvious where your extra £40 has gone – all on crackle-black-effect MDF. Actually, that's not entirely fair. 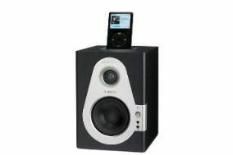 The 4is are certainly a bigger proposition (23 x 17 x 23cm), but that extra bulk is used to house a bigger (11cm) driver, and the active right-hand speaker sports a full 20 Watts of power per channel. Otherwise, specification is as per the Studiodock 3i, and that's no bad thing: integrated iPod dock, USB input for streaming digital audio, stereo RCA and 3.5mm inputs, and a headphone socket is a pretty comprehensive list. A lossless copy of Jeff Buckley's Lover, You Should Have Come Over is a fairly benign place to start, but the 4is immediately reveal the aural differences between themselves and their little siblings. Where the Studiodock 3is are very much an up-and-at-'em listen, the 4is are altogether more considered – and that's not an approach we're altogether sure we approve of. There's certainly no shortage of fluency throughout the midrange, where Buckley's longing is explicit, but there's a definite reining-in of the more visceral aspects of the song. This tendency is even more apparent when we switch to a 128kbps file of Shorty Long's A Woman Just Won't Do Right – the 4is seem so determined to control the low frequency punch of the song that the results are almost prim. That's not to say that you should discount the 4is out of hand. They describe a very convincing soundstage, manage to keep the high frequencies just the right side of splashy, and grant vocalists character and eloquence. And, of course, their physical dimensions mean that they deliver an entirely different scale of performance to the 3is. With a bit more of the 3is' zest these Samson 4is could be a great active speaker solution – but, sadly, they're just a little short of enthusiasm, and as a result so are we.